TIMELESS® Exterior Paint + Primer is formulated with our newest innovations and technology providing complete one coat* hide, coverage and durability. With PPG TIMELESS® UV-Protect Technology, you get one coat* coverage in 1,000 colors and the best resistance to extreme weather. ** The tough finish provides exceptional resistance to chipping, flaking and cracking and provides a mold, mildew and algae resistant coating. *One coat coverage only when tinted to colors specified for PPG Timeless Interior Paints. **The Best Resistance to Extreme Weather is comprised of Dirt Resistance, UV Resistance and Cyclic Environmental Testing. Surface must be clean and dry. Remove all loose, peeling paint, dirt, mildew, grease, oil, chalk, rust, and any other surface contaminants. Repair all moisture problems. Blistering and peeling issues are commonly caused by moisture behind the paint film. Putty all nail holes and caulk all cracks and open seams. Sand all glossy, rough and patched surfaces. 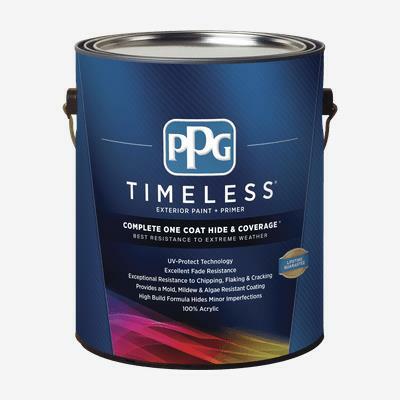 When PPG Timeless exterior paint is applied to an uncoated substrate or to bare wood, two coats are required with the first coat acting as the primer. For metal, tannin staining woods, fresh concrete or masonry (less than 30 days cure), or chalky surfaces, use of the appropriate high quality specialty primer is recommended for best results. COVERAGE: Approximately 250 to 300 sq. ft. (23.2 to 27.9 sq. meters) per U.S. gallon (3.78 Liters) on primed, smooth, nonporous surfaces.